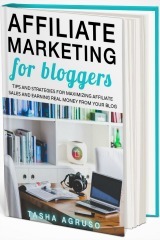 This article includes affiliate links. Please visit my disclosure page for more information. 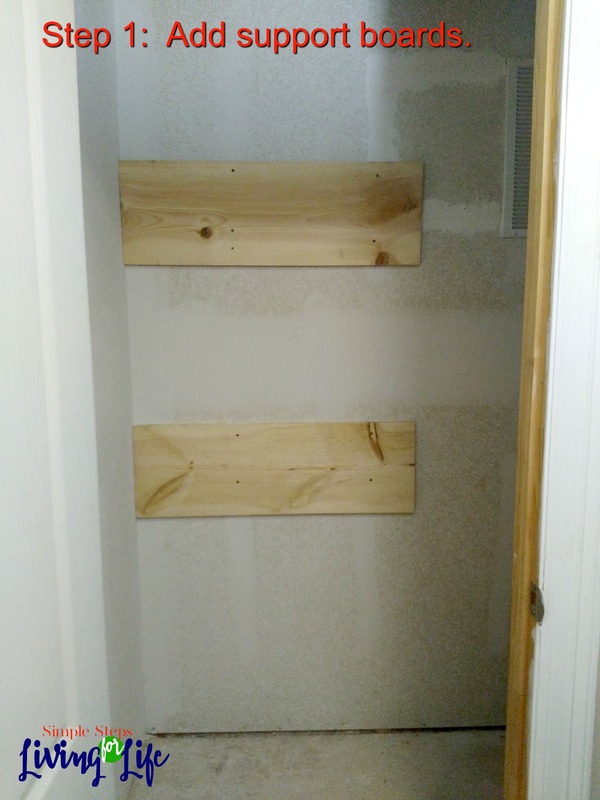 The upstairs half bath had an ugly step-sister… an unfinished closet. With the help of a fabric remnant, some paint, and installed shelves, it is now the bell of the ball. Ok, that’s a bit dramatic since there still is a hot water tank and a vent to the attic but, hey, this gal’s got a vivid imagination! 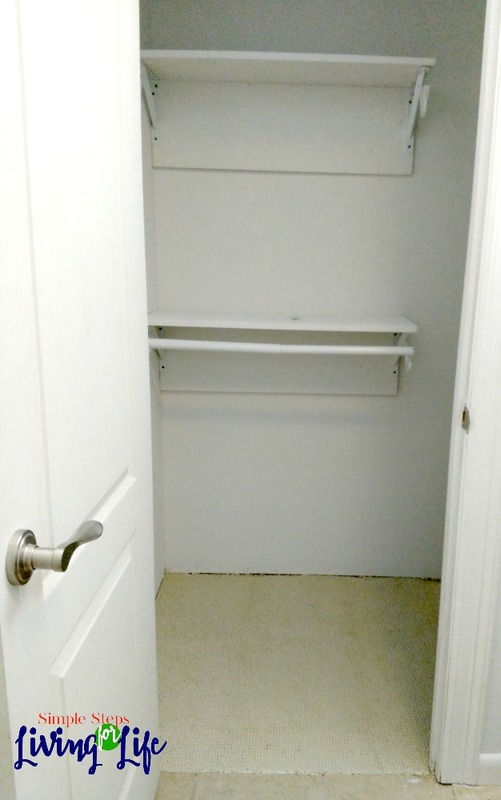 Back to the project at hand… Here’s what the closet looked like initially. 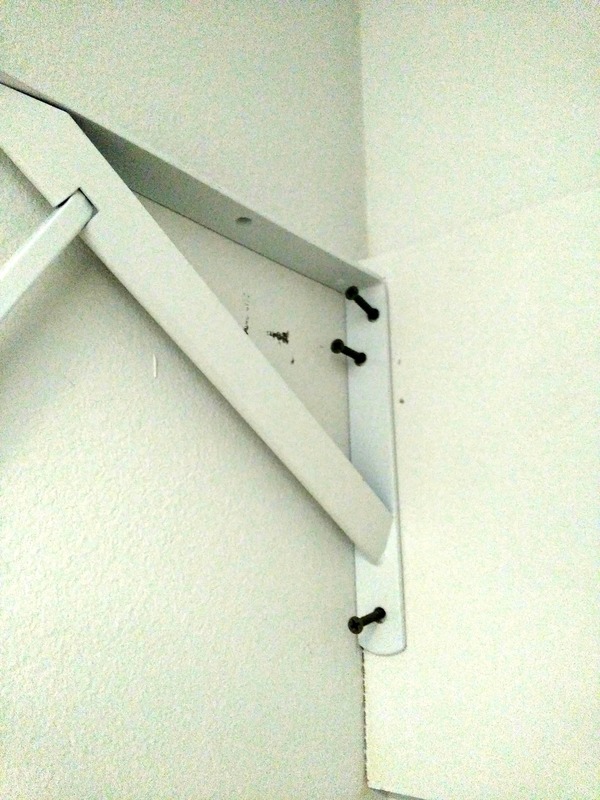 The first step for installing the shelves was to create a support base for them to hang from. Since the hot water heater is to the right of them, there was no wall on that side to just hang the shelving units that way. 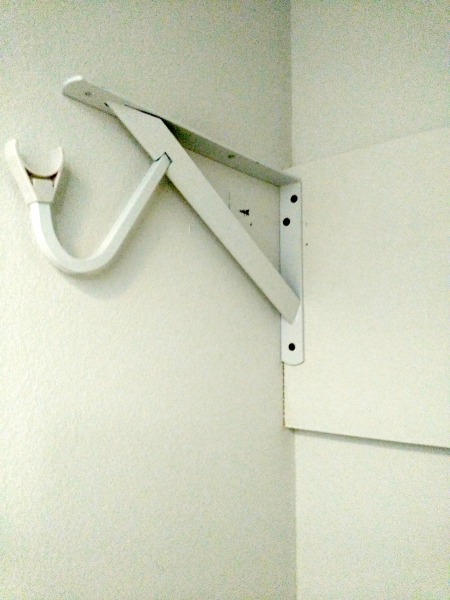 I also couldn’t attached the bracket just anywhere on the drywall because it would not support the weight. To add the support boards, first I needed to locate and mark where the studs in the wall were located. 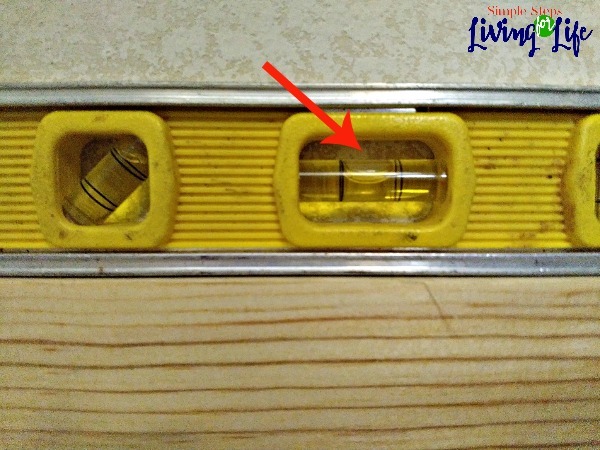 Read about how to locate studs in the wall using a stud finder here. Last, I got the drill and a 4 screws per board and attached the board to the wall making sure I was anchoring it to the studs. Now it was time to paint. I didn’t bother painting the backside of the boards since I knew they wouldn’t be seen. When I painted the closet with the anchor boards installed, I went ahead and painted the two boards I would be using for the shelving. Quick tip: If you want to continue to use your paint brush or roller the next day(probably not much longer than that), simply wrap it up as tightly as possible with plastic wrap. Now it was time to mark the location of the shelf brackets. I decided that the shelf would be flush against the top of the front of the support board. I had to measure the thickness of the board. Then I measured and made a mark from the top of the support board to know where the top of the bracket would go. I put the bracket on the support board lining up the top of the bracket with the mark I made and then marked the holes for the screws. Some people might try to hold up the brackets and screw in the brackets in without pilot holes, but I’m not that coordinated. I used the same screw to drill about 12 pilot holes. Does it sound like a waste of time? Trust me. Klutzy should be my middle name. Don’t believe me, then take a side trip to this post to see what happened to my thumb and then come back… I’m so glad you’re back! Ok, drilling pilot holes is super helpful for uncoordinated people like me. Instead of trying to hold the bracket and screws in place while using the cordless drill, I could go ahead and twist the screws into place to hold the bracket. Next was to add the two shelves and add the two rods. 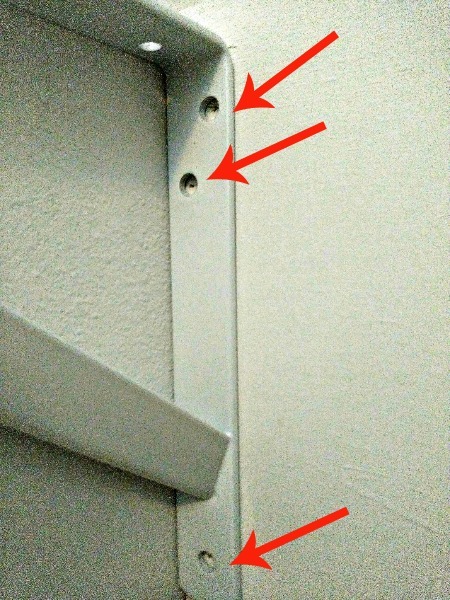 There were two holes per bracket to secure the shelves from the top of the bracket to the bottom of the shelf. 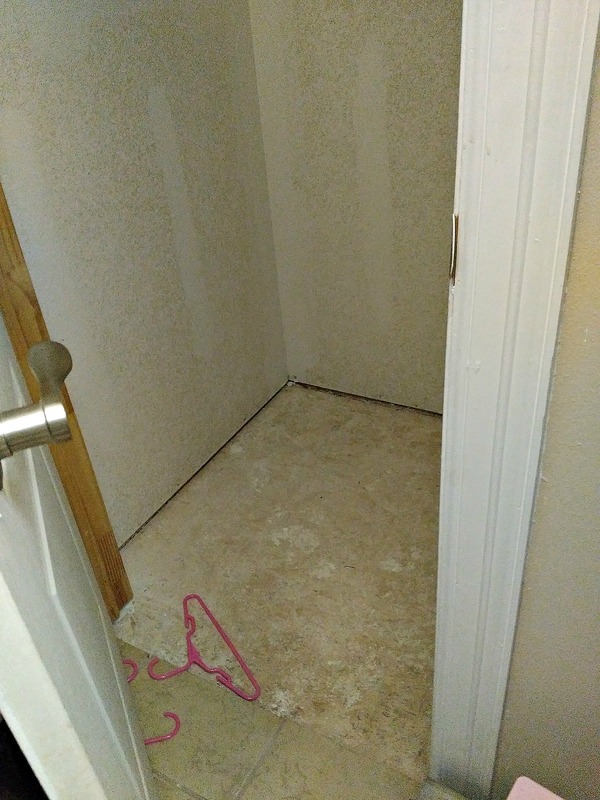 And for the finishing touch… a high-end carpet remnant (for only $10) was added for flooring. We official have another closest in our home! 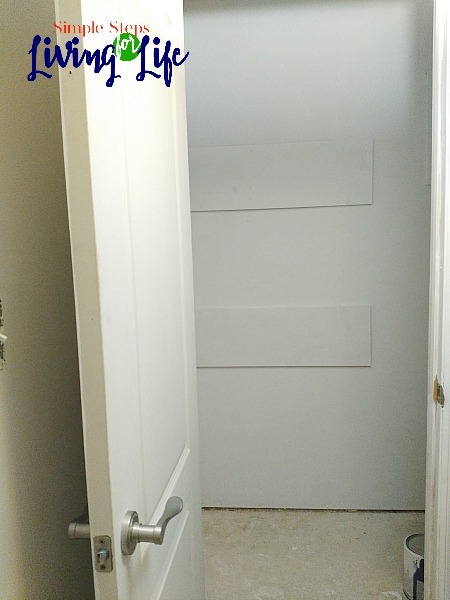 At some time in the future we will be adding baseboards and casing will be added to the closet side of the door. 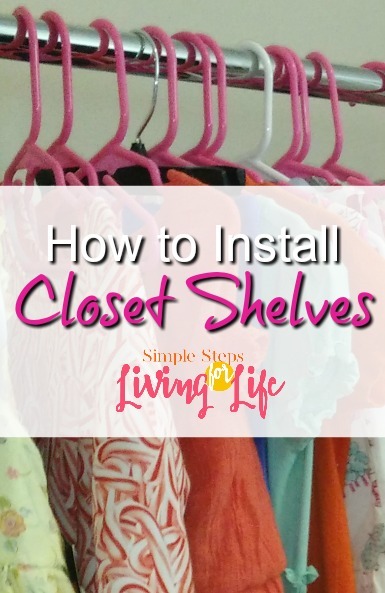 Until then I’m just so excited that clothes won’t be stored on a wobbly rack in the bathroom any more. Good times! Thanks so much for visiting this tutorial. Leave me a message in the comments below if you have any questions or want to chat! 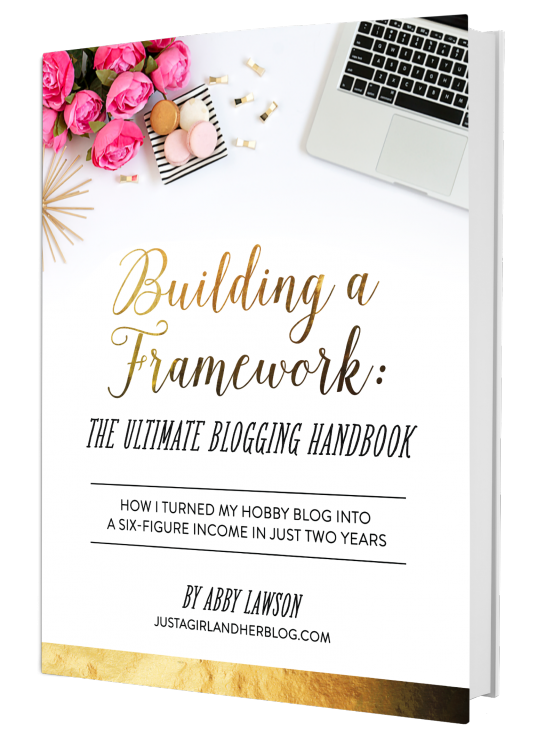 Love your photos and pin-able graphic! You are SO TALENTED! I always get excited to see your new DIY stuff! It’s always GENIUS!